Wahama junior Ashtyn Russell dribbles the ball past a Miller defender during the first half of Thursday night’s TVC Hocking girls basketball contest in Mason, W.Va.
Wahama freshman Emma Gibbs releases a shot attempt during the second half of Thursday night’s TVC Hocking girls basketball contest against Miller in Mason, W.Va.
MASON, W.Va. — Close, but no proverbial cigar. The Wahama girls basketball team turned a 15-point third quarter deficit into a two-point deficit with just over two minutes left in regulation, but visiting Miller ultimately held on for a wire-to-wire victory on Thursday night during a 46-42 decision in a Tri-Valley Conference Hocking Division matchup at Gary Clark Court in Mason County. The host Lady White Falcons (5-9, 3-9 TVC Hocking) kept things interesting as the night progressed, as the other Lady Falcons (9-6, 9-5) built an early 10-point first quarter lead and eventually made it hold up. WHS was competitive for the first seven minutes of regulation, but a turnover streak in the final 40 seconds of the opener resulted in six straight Miller points — allowing the guests to turn a slim 9-5 cushion into a 15-5 advantage. The Red and White were never closer than eight points in the second frame as MHS led by as many as 14 points before taking a 26-13 lead into the break. Ashley Spencer opened the second half with a basket at the 7:06 mark, resulting in the Purple and White’s largest lead of the game at 28-13. Hannah Rose answered with 10 points as part of a 14-8 surge over the rest of the third period, allowing the hosts to whittle the deficit down to 36-27 headed into the finale. Emma Gibbs scored 10 points in the fourth quarter as part of 15-10 charge down the stretch, which included a pair of free throws at the 2:18 mark that cut the lead down to 42-40. MHS answered with four straight points and ended the game on a 4-2 run to complete the two-possession outcome. 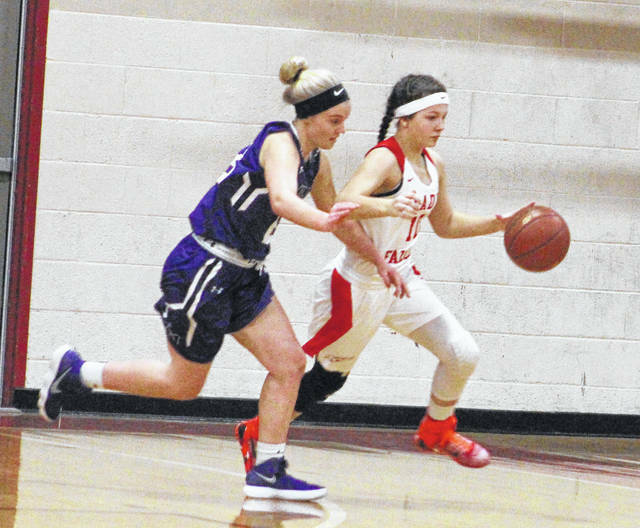 Miller also claimed a season sweep of Wahama with a 76-24 decision in the first meeting in Corning back on Dec. 16, 2017. 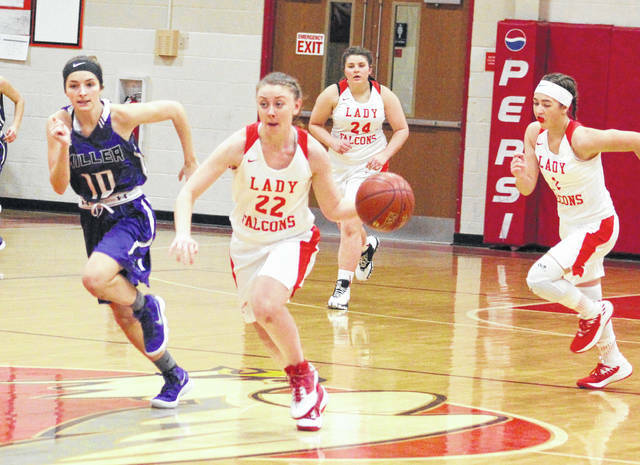 The Lady White Falcons made 13 total field goals — all two-pointers — and also went 16-of-29 at the free throw line for 55 percent. The hosts were just 7-of-17 at the charity stripe in the opening half. Rose led WHS with 20 points, followed by Gibbs with 14 points and Victoria VanMatre with four markers. Elizabeth Mullins and Ashtyn Russell completed the scoring with two points apiece. The Purple and White made 18 total field goals — including five trifectas — and also netted 5-of-12 free throw attempts for 42 percent. Spencer led Miller with 20 points, followed by Chloe Rine with eight points and Lacey Alexander with six markers. Askya McFann and Halle Joseph were next with five points apiece, while Sophia Compston completed the winning tally with two markers. Just 24 hours earlier, Wahama picked up its fifth win of the season with a 56-36 victory over host Wirt County. The Lady Falcons built an early 16-13 first quarter lead, then made a 13-9 run just before the break to secure a 29-22 cushion headed into the intermission. Wahama’s defense proved to be formidable in the third canto as the guests made a 16-3 charge that resulted in a 45-25 cushion headed into the finale. Both teams scored 11 points down the stretch to wrap up the 20-point outcome. 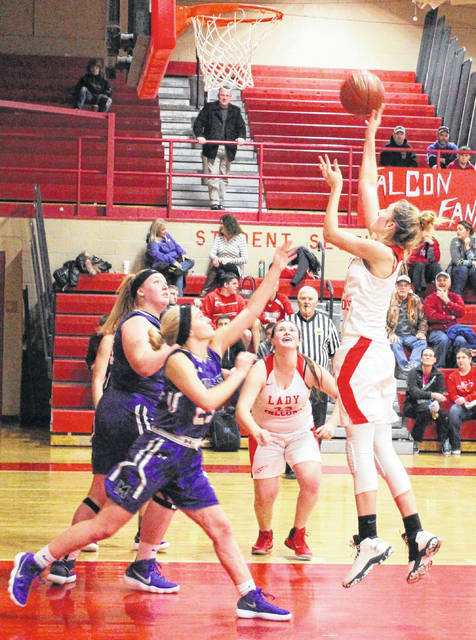 The Lady Falcons made 23 total field goals — including two three-pointers — and also went 8-of-17 at the free throw line for 47 percent. Rose led WHS with a game-high 30 points, followed by Gibbs with 16 points and Harley Roush with six markers. VanMatre also had four points in the winning cause. The hosts made 12 total field goals — including four trifectas — and also went 8-of-20 at the charity stripe for 40 percent. Taylor Anderson paced WCHS (2-12) with 21 points, followed by Emma Wyer with seven points and Sydney Woods with four markers. Shelby Simonton and Morgan Wagner respectively added three points and one point in the setback. Wahama traveled to Southern on Saturday and returns to action Monday when it hosts Eastern in a TVC Hocking contest at 7 p.m.